If your account is enabled for video calls, you can make face-to-face video calls with your contacts. All you need is a camera and your computer’s speakers and microphone. You can also use a headset if your computer doesn’t have built-in audio devices. 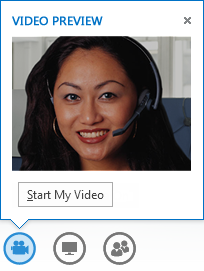 Note: To find out whether video is enabled for your account and available, contact your workplace technical support. Open Lync, and either find a contact in your Contacts list or type a name in the search box to find the person you’re looking for. To end the call, close the window, or click the end call button. To end all video, point to the camera icon, and click Stop My Video. The audio will continue. Lock the Video Spotlight to turn off video/photo of everyone other than the person in the spotlight.